MI offers custom array services and array products providing not only exceptionally precise and accurate spot placement and reproducibility, along with documentation of array quality for each production lot. Validation data for each lot we produce allows you to work in confidence, knowing that MI fully warrants our work to meet your specifications. Every array lot is closely scrutinized before shipping to detect adequate sample deposition, probe coupling, surface chemistry anomalies and DNA or protein probe concentration variations outside of normal limits. This is accomplished through a variety of imaging modalities and assays using randomly harvested slides from each print run. The data is condensed into an easy-to-understand QC report for each order. Verification that important samples are present on your array can impact results. Absent or low signal intensity may not always be an indication of expression level, but rather the result of inadequate or failed sample deposition. MI validates every production lot of arrays using a visual-light scan of representative slides, allowing the identification of missed or inadequately deposited samples. The resultant data denote the exact array and source plate location of any depositions with suspected inadequate material. As a result, MI can validate which samples were deposited and will warranty any array that does not meet your project specifications. Individual DNA samples may vary in their ability to effectively bind a solid substrate. When these deficiencies go undetected, coupling variability among samples may confound data interpretation. MI's Veriprobe microarray QC assay can improve the overall confidence level of the resultant hybridization data by verifying the relative amounts of probe present and by identifying spots of marginal value. To assay coupling efficiency, MI uses our proprietary Veriprobe methodology to attach a fluorescent tag to substrate-bound nucleic acids. This assay is quantitative and provides an accurate means of determining the relative levels of bound probe. 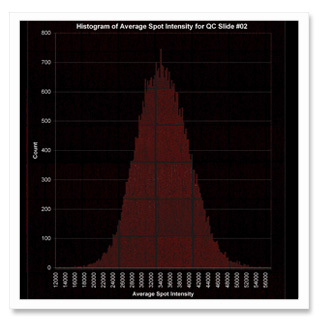 An image of the reaction, intensity data, and an overall intensity histogram from a representative slide is provided in the QC report for each lot. For protein samples, MI can often incorporate an off-channel fluorophore, which will not interfere with subsequent analysis. This dye can be used to monitor volumetric transfer and spotting morphology. 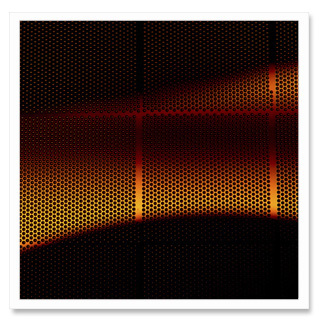 MI can also QC protein arrays using functional assays to validate array quality.